Spillbusters Ltd offer a standard range of general purpose/universal, oil only and chemical spill kits suited for all types of liquid spills. The kits are available in convenient portables and easily maneuverable wheelie bins ranging from 25 litres through to 240 litres. These options will help assist a diverse range of work environments including workshops, service and delivery vehicles, industrial warehouses, manufacturing plants, storage facilities and service stations. ... just to name a few! Having our spill kits on hand will give you peace of mind knowing that you are better prepared to help protect your business, your people and the environment from potential spills with hazardous substances. Customised Spill Kits - We know that all work environments differ depending on the nature of the business and that's why we will work with you to customise the perfect spill kit solution best suited to meet your own individual and specific needs. Contact us today to discuss your requirements. This spill kit comes in a robust waterproof carry bag that is easily carried to spills. Can be used for hydrocarbon spills including, oil, petrol, diesel and a range of liquid chemicals spills. Most ideal options suitable for smaller workshops, service vans, delivery trucks. Can absorb up to 25L. This spill kit comes in a robust waterproof carry bag that is easily carried to spills. Can be used for hydrocarbon spills including, oil, petrol, diesel and a range of liquid chemicals spills. Most ideal options suitable for larger workshops, commercial vehicles, service vans, delivery trucks. Can absorb up to 50L. This spill kit comes in a robust waterproof carry bag that is easily carried to spills. Can be used for hydrocarbon spills including, oil, petrol, diesel and a range of liquid chemicals spills. Most ideal options suitable for larger workshops, commercial vehicles, service vans and delivery trucks. Can absorb up to 80L. This wheelie bin spill kit is easily transported to spills. Can be used for hydrocarbon spills including, oil, petrol, diesel and a range of liquid chemicals spills. Most ideal options suitable for larger workshops, industrial warehouses, manufacturing plants, storage facilities and service stations... The wheelie bin is easily identified as a spill kit and should be placed in a prominent position near where liquids are stored or used. Can absorb up to 120L. Can absorb up to 240L. Oil only spill kit comes in a robust waterproof carry bag that is easily carried to spills. Contains specially treated polypropylene absorbents that repel water but absorb hydrocarbon based liquids including oil, petrol and diesel. Most ideal options suitable for smaller workshops, service vans, delivery trucks. Can absorb up to 25L. Oil only spill kit comes in a robust waterproof carry bag that is easily carried to spills. Contains specially treated polypropylene absorbents that repel water but absorb hydrocarbon based liquids including oil, petrol and diesel. Most ideal options suitable for smaller workshops, service vans, delivery trucks. Can absorb up to 50L. Oil only spill kit comes in a robust waterproof carry bag that is easily carried to spills. Contains specially treated polypropylene absorbents that repel water but absorb hydrocarbon based liquids including oil, petrol and diesel. Most ideal options suitable for smaller workshops, service vans, delivery trucks. Can absorb up to 80L. 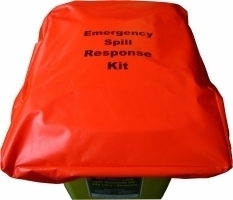 Oil only wheelie bin spill kit is easily transported to spills. Contains specially treated polypropylene absorbents that repel water but absorb hydrocarbon based liquids including oils, petrol and diesel. Most ideal options suitable for larger workshops, industrial warehouses, manufacturing plants, storage facilities and service stations... The wheelie bin is easily identified as a spill kit and should be placed in a prominent position near where liquids are stored or used. Can absorb up to 120L. Oil only wheelie bin spill kit is easily transported to spills. Contains specially treated polypropylene absorbents that repel water but absorb hydrocarbon based liquids including oils, petrol and diesel. Most ideal options suitable for larger workshops, industrial warehouses, manufacturing plants, storage facilities and service stations... The wheelie bin is easily identified as a spill kit and should be placed in a prominent position near where liquids are stored or used. Can absorb up to 240L. Chemical spill kit comes in a robust waterproof carry bag that is easily carried to spills. Contains specially treated polypropylene absorbents that will not breakdown when used with aggressive chemicals. Most ideal options suitable for smaller workshops, service vans, delivery trucks. Can absorb up to 25L. Chemical spill kit is easily transported to spills. Contains specially treated polypropylene absorbents that will not break down when used with aggressive chemicals. Most ideal options suitable for smaller workshops, service vans, delivery trucks. Can absorb up to 50L. 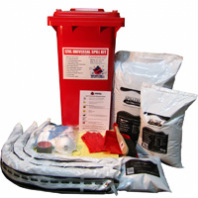 Chemical wheelie bin spill kit is easily transported to spills. Contains specially treated polypropylene absorbents that will not breakdown when used with aggressive chemicals. Most ideal options suitable for larger workshops, industrial warehouses, manufacturing plants, storage facilities and service stations... The wheelie bin is easily identified as a spill kit and should be placed in a prominent position near where liquids are stored or used.